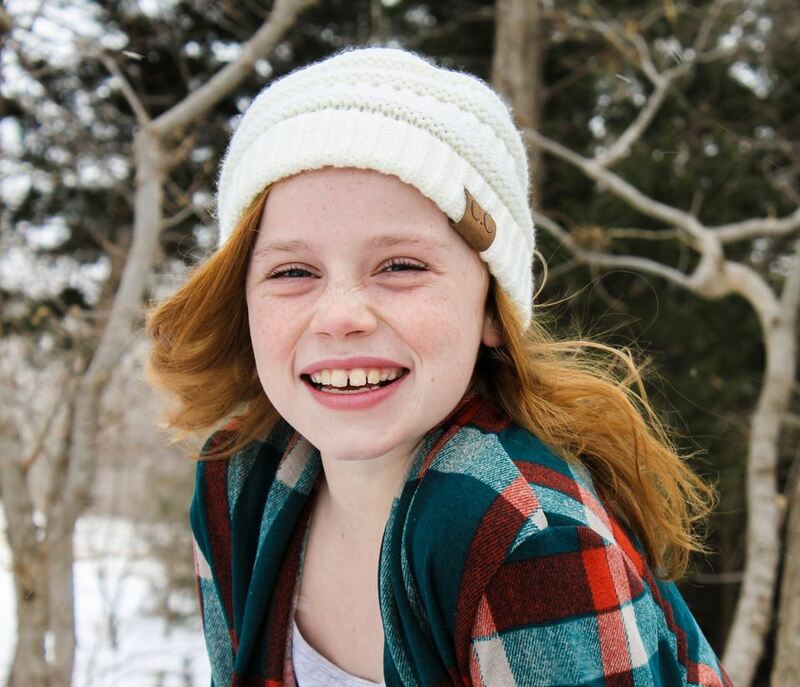 To make matters worse, her mom got in a car accident when Elaina was five or six. Her mom was never the same again. Elaina remembers her mom reaching towards her when she woke up in the hospital. “Call grandma and get me my heroine,” were her first words to her little girl. Elaina was removed from her home and placed with her grandma and uncle who also used drugs. Tragically, Elaina’s grandma died soon after that placement. Elaina was then placed with her other grandmother. This grandmother adopted Elaina, but almost unbelievably, she soon passed away as well. Elaina then moved in with her grandpa and an aunt and uncle. By this time she was in 6th grade. She says she would often cry alone in her bed, but no one would come to comfort her. She knew they could hear her through the thin walls, but they didn’t come. She felt like no one in the world cared about her. She had lived in eight different homes with eight different families in her 12 short years. Last summer, Elaina moved in with another aunt and uncle who have a few young children of their own. Intermountain is working hard to make sure this will be Elaina’s forever family. Elaina is convinced that her aunt and uncle will either reject her at some point or pass away unexpectedly, and it’s easy to see why she feels that way. 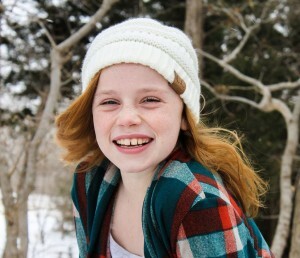 At one point, Elaina was so uncontrollable she had to spend time in a psychiatric hospital. She was terrified to be there because, she says, her sister had gone to that facility before, and she never saw her again. 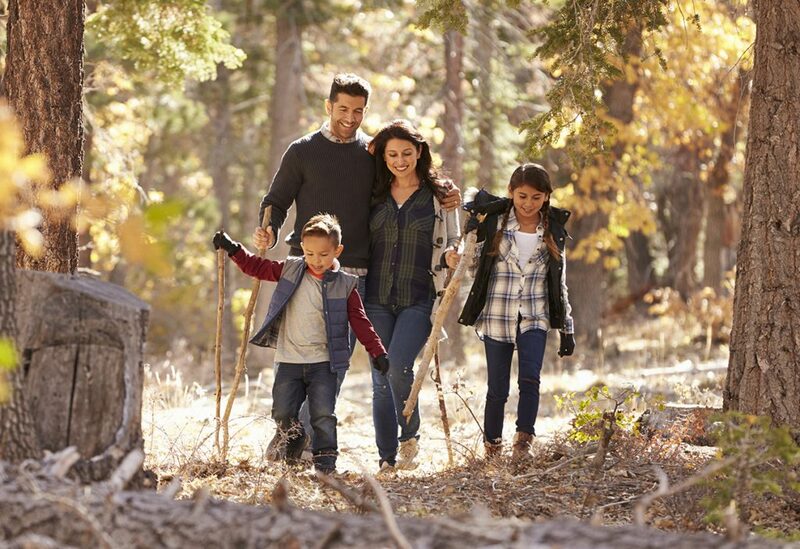 Thank you for supporting Intermountain. 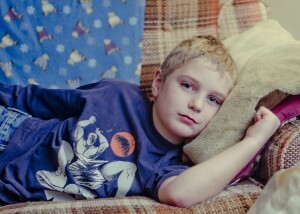 For more information or to find out how you can help children like Elaina, call 406-457-4804. 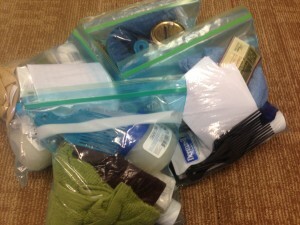 Recently, our children assembled hygiene kits for students in Africa as part of a special service project. These hygiene kits are given to students that come from far away to attend the International Evangelism Centre in Salika, Tanzania. At the Centre, these students prepare to be church planters and pastors to a number of countries in East Africa. The relatively few supplies—all fitting into a 1 gallon Ziplock bag—are a tremendous blessing to these eager, but often impoverished, students. Combined with this activity, and as part of our resilience series, we talked about the Parable of the Good Samaritan and just what it means to “love your neighbor as yourself.” We discussed how it can be hard to know how to ask for help, and how we can be hesitant to offer assistance, too. 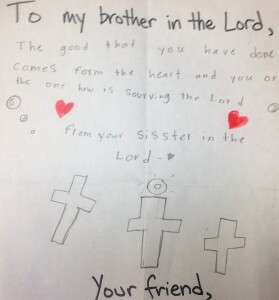 In assembling the kits, our children were encouraged to write a note of blessing to the students that would receive their gift, and how the note from them was just as important as the tangible gifts they were giving… because it symbolized their desire to connect on a personal level. 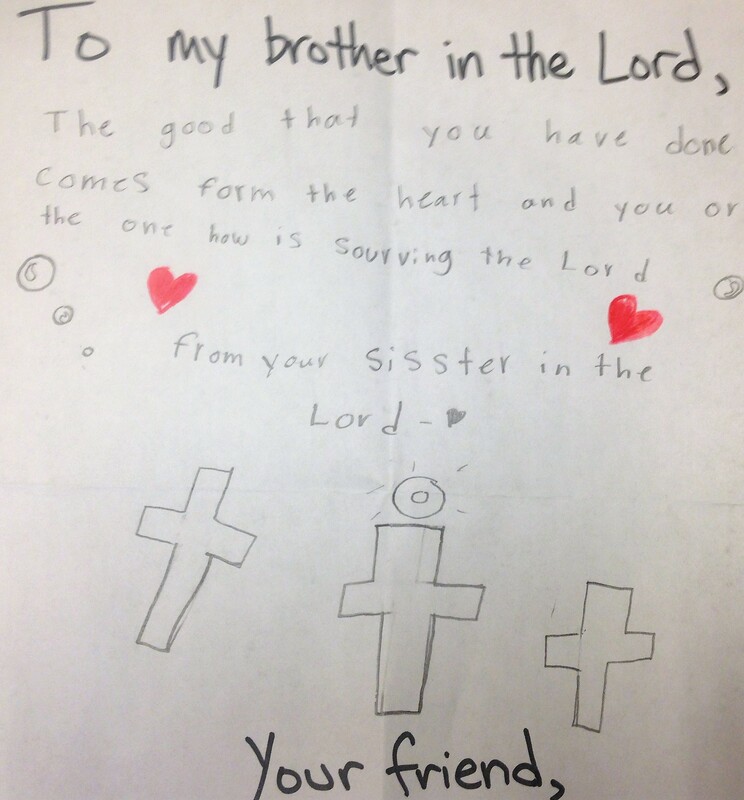 For many of our children, uprooted from their homes and working through some very difficult issues and matters of relationship, it was a healthy reminder that they, too, have something to give. 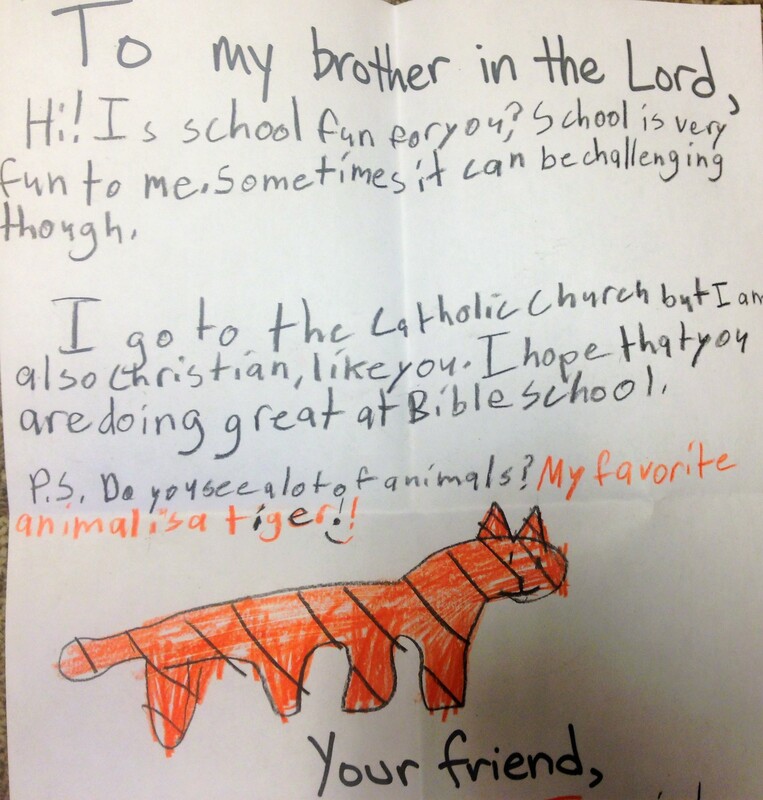 They could see in a very tangible way that they had been blessed to be a blessing. While it may seem odd to those who have not experienced childhood trauma or adversity, an individual who felt unsafe as an infant or child can have a disruption in their relational, physical, and emotional development that inhibits their brain’s ability to accurately interpret their world. Stress hormones can flood their brain and send them into a state of re-traumatization (sometimes referred to as “being triggered,” but it’s more like a switch has been flipped or the floodgates on an emotional dam have been released!) that makes it impossible for them to engage in higher level thinking tasks while in that heightened emotional state. Everything in their brain is telling them they should rightly fear for their life and either run, fight, or shut down (“play possum”) in order to survive that moment. What might set of a state of re-traumatization differs from individual to individual based on their experience. The response that care givers, friends, family members, and hopefully faith communities can react with is to establish felt safety. This can be hard to learn, as those who are re-traumatized in the moment and are feeling unsafe often express it in unsafe ways! This, in turn, can cause those of us caring for these individuals to feel unsafe and have our own fight-flight-freeze response. Only by being consciously aware of our responses, taking a moment to regulate ourselves, can we then provide a response that will communicate safety and calm to the re-traumatized individual we are seeking to help. 1. “Felt” safety is just that… Ask, “What is going to FEEL safe to the individual?” This is not the time to argue or convince… remember the individual is not in command of their executive functioning or reasoning skills anyway! Telling someone, “You are safe… no one is trying to hurt you!” is not as powerful as checking your posture, your tone of voice, and the setting to see what can be done to communicate safety. 2. Understand that when someone is traumatized or triggered, their responses will be more “all or nothing”; extreme; black or white; friend or foe. They may not even be seeing you as the “safe person” you are, but rather might be seeing you as their abuser. Do not take offense! This moment will pass. 3. Give simple, direct instructions… one at a time. Your anxiety in the situation may lead you to want to give more than one instruction at a time or pile on words (that’s what I tend to do!). So, an example would be: “I can see something has upset you… please take a deep breath with me.” Repeat that as many times as needed to get them to slow down and take a deep breath. Taking deep breaths is a scientifically proven way to help move someone from the flight-flight-freeze response to a more regulated position from which they can be calmed and reasoned with. If you are curious about why that is, you can read more HERE. After you get them to take a breath, then you can continue with other simple, direct instructions related to safety. I have found that having to step in for a child to help them regulate from a re-traumatizing experience is almost always embarrassing for them, bringing up a sense of shame or brokenness. As ML Rutherford suggests in the video above, ultimately that child or individual you are working with will thank you for demanding that they be safe and that you ensure a safe environment be present for them, as well. This might involve certain structures in place or circumstances that apply to them that don’t apply to other children. If these requirements always relate back to safety (especially that FELT safety, remember!) and don’t appear arbitrary or punishing, these limits communicate the LOVE we want to express to those who are trauma-affected. Ultimately, as ML says, these children (and older individuals!) will thank you for your care and understanding of their needs. And, if we can teach them self-awareness about how they can establish safe boundaries for themselves and the ways they get “triggered” and can either prevent or move through those events, we will have brought a greater sense of healing and wholeness to them that gives them a sense of dignity and ownership of their emotional world. 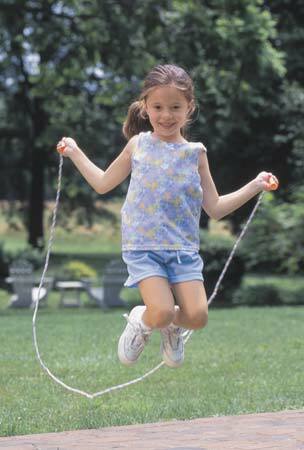 Objects needed: A jump rope. Theme/Main Idea: God keeps his promises, and that should cause us to jump for joy! “Have you ever been so happy that it was hard to hold it in? Yes? What are some of the reasons you have had to be happy? Wow! Those are great reasons to be excited and happy. Now, I am wondering if anyone here can tell me, without using a word, that they are happy? Can someone here act out being happy for us without shouting or making any noise? Amazing, you guys! I could tell that each of you were happy and you didn’t have to say a thing. But, I suppose I should get on with the object lesson… what do you think? Would you like to see what I brought today? Yes… okay. Here is it! I suppose you all know what this is? Right. 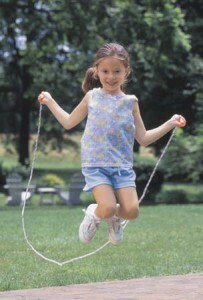 It’s a jump rope. Do you know why I have a jump rope? 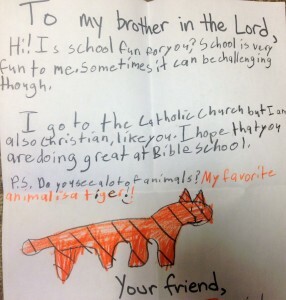 It has something to do with our lesson from Luke, chapter 1 today. It’s the story of Mary, just pregnant with Jesus, visiting her relative, Elizabeth, who is pregnant with John the Baptist. When Mary calls out to greet Elizabeth, the baby inside her jumps for joy! Even still inside Elizabeth, waiting to be born, John recognizes how important it is that Mary is going to be the mother of Jesus. Incredible, isn’t it? Elizabeth certainly thought it was. She made sure to tell Mary that the baby in her jumped for joy. There was a lot of joy and anticipation coming before that first Christmas morning. I hope that we can hold on to some of that excitement, too, and even let our bodies express it. Maybe thinking about how amazing it is that Jesus was born to show us God’s love makes you jump for joy, too? I sure hope so. We are so close to Christmas! Part of the joy of celebrating comes not only from the gifts we think we are going to receive, but also from the gifts we give and are excited to see others get! 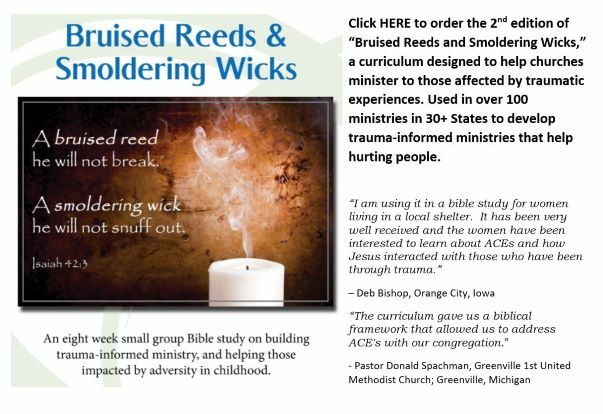 I am pleased to announce that a NEW, 8-week version of the study, “Bruised Reeds and Smoldering Wicks,” is now available. Two additional weeks of materials have been added to address caring for adults who are experiencing trauma and a “where do we go from here?” lesson on implementation and strategic next steps for congregations seeking to be trauma-informed. You can order the second edition of the curriculum by clicking HERE. I am indebted to the over 100 congregations, homeless shelters, small groups and various ministries across the United States and Canada that engaged with the first edition of the materials. Their feedback and encouragement has hopefully made the second edition better and more comprehensive. I am thankful for those who are willing to explore these issues within their faith communities and I praise God for what that might mean for so many that have yet to find a church or fellowship that welcomes them as they work through their trauma story. “I give my highest recommendation of the Bruised Reeds & Smoldering Wicks adult study. Each of the six classes provided valuable information about the importance of trauma-informed ministry. In addition to learning more about compassionate care, I found the scripture, readings, short videos and discussions very uplifting to me personally by enriching my Christian faith.” – Suzanne Mannix, Mental Health Advocate; Helena, MT. 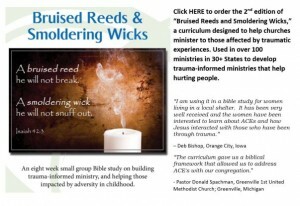 “The Bruised Reeds study was recommended to our church by a mental health professional who is also a Christian. We had already been learning about the scientific studies and medical evidence that have caught up with what God has already told us in His Word. Our faith is strengthened as we move forward in creating a new trauma-informed environment at our church… We participated in this study as a pre-cursor to starting a new ministry. The leaders have announced a fellowship meeting that will take place … and we invited all the people who expressed an interest in finding support at the church.” – Heather Halverson; Annandale, VA.